Monthly Saturday Food Pantry – today 10:30am – 12:00pm The Food Pantry offers Penn Hills residents the opportunity to receive free dry goods groceries on a monthly basis. 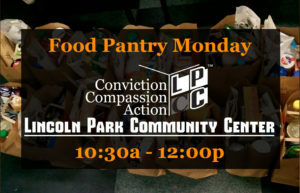 The Food Pantry is ALWAYS the Monday after the Second Saturday of Each Month. Please plan to arrive no earlier than 10:00am as we are unable to accommodate anyone who arrives prior to this time. Please remember to bring your own bags and/or boxes to carry your food. LPCC Fresh Vegetable Pantry – Today 4:30pm – 6pm The Food Pantry offers Penn Hills residents the opportunity to receive free fresh vegetables (and some fruit) on a weekly basis. 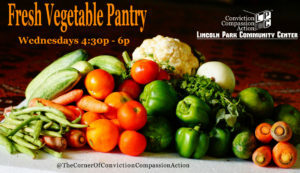 The Fresh Vegetable Pantry is Every Wednesday. Please plan to arrive no earlier than 4:30 pm as we are unable to accommodate anyone who arrives prior to this time. Please remember to bring your own bags and/or boxes to carry your food.